For most lifters in the gym there’s nothing better than a skin-splitting pump. What could be better? Maintaining that vicious pump outside of the gym, that’s where Alchemy Labs 24 HR Pump comes in. With a simple yet tremendously effective combination of three well known compounds, the dream becomes a reality. Let’s take a look at what makes the 24 HR Pump so effective. 1-Lauroyl-Glycerol - This compound, also known as monolaurin, can be found naturally in coconut milk as well as breast milk. Monolaurin’s main purpose in 24 HR Pump is to help hydrate the body which in return increases blood volume levels. The combination of increased, constant hydration and muscle stimulation is what helps create the big pump. You’ll also find immune and digestive system support with monolaurin. Sodium Chloride - Ever get a big pump after a dirty meal? Sodium chloride is one of the reasons why. This compound, also known as salt, helps maintain hydration in the body (being an electrolyte), transport nutrients, and stabilize blood pressure. Potassium Chloride - This compound helps with glycogen uptake as well as, you guessed it, hydration. The proper combination of sodium and potassium chloride can lower blood pressure and influence how your cell’s regulate your body energy. TetraSorb Delivery - This is Alchemy Labs’ patented capsule delivery system. This delivery system ensures that the compounds are directly absorbed in the gut and not prematurely exposed. The prolonged delivery of the compounds allows for lengthened activity thus getting more out of your favorite products. 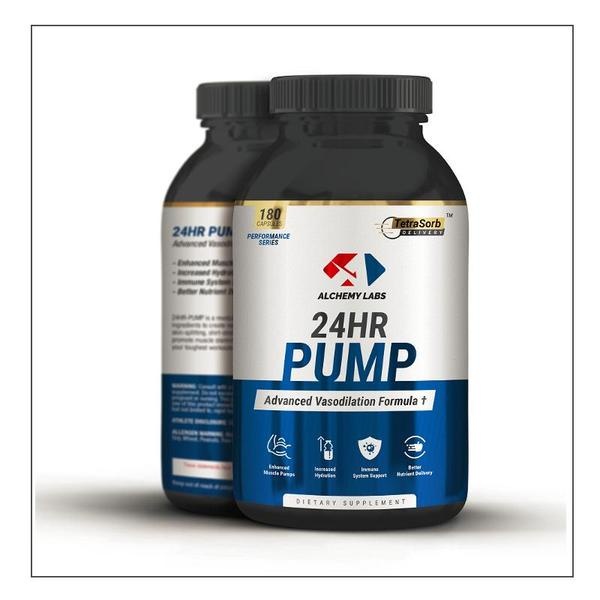 Alchemy Labs 24 HR Pump blends three pump stimulating compounds with a delivery system that allows for longer effects. You can take 24 HR Pump by itself or in combination with your favorite pre-workout. We recommend taking 24 HR Pump a half hour before the gym. Want to grab a bottle and try it out for yourself? Head over to our website! Available online and in-store.